Zen Hot Tubs are a unique one-piece spa that is made from an advanced, non-slip, low-maintenance polymer surface. One main benefit of the spas, are their size and weight, their one-piece polymer shell allows them to be lightweight and highly portable. All models come with two large access panels on all sides to make any maintenance or repairs easier. They are made with Sustainablue Spa Insulation which is made from post consumer recycled denim that is thermally bonded. 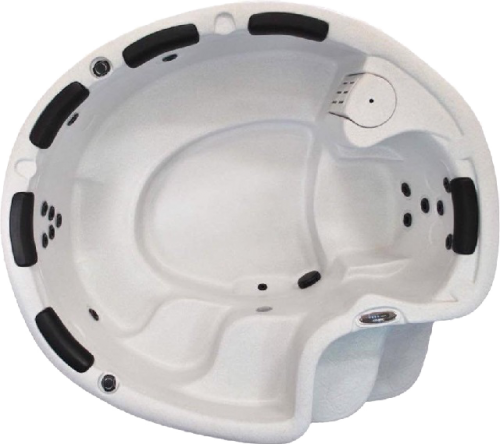 Zen Hot Tubs feature a solid one piece bottom, which allows you to place your spa on ANY flat, level surface. The spas have variable depth seating and strategic jet placement that gives maximum therapy for all body types. A multi coloured LED light is included with all Zen Hot Tub Models to enhance the water’s appearance and create a soothing ambience for a more enjoyable spa experience. The Getaway spa has been manufactured in a way that it can fit through any standard doorway with reasonable access. The Sanctuary comes with built in steps which gives you ease of getting in to and out of the spa.